According to multiple reports, the UFC is on the cusp of adding four bouts to their monumental UFC 100 event. The July 11th card will be taking place at the Mandalay Bay Event Center in Las Vegas, Nevada. Jonathan Goulet will look to redeem himself after his embarrassing 33 second loss to Mike Swick at UFC Fight for the Troops back in December, as he will be taking on Dong Hyun Kim. 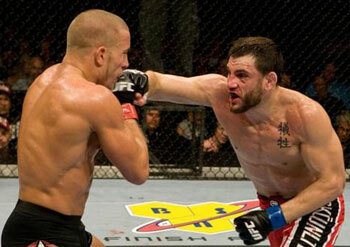 Although Kim fought valiantly, he lost a close split decision to Karo Parisyan at UFC 94. According to the popular Brazilian website TATAME, former UFC welterweight top contender Jon Fitch is being considered as an opponent for Paulo Thiago. Fitch, who also fought at UFC 94, responded nicely from his loss to champion Georges St-Pierre by defeating Akihiro Gono in a unanimous decision. Thiago will see if he can add another American Kickboxing Academy fighter to his list of victims after upsetting Josh Koschek last month at UFC 95. Jon Jones, who is clearly one of the division’s up-and-coming stars, will follow up his shellacking of Stephan Bonnar with a light heavyweight bout against Jake O’Brien. Finally, Matt Grice will be returning from a 14-month hiatus to take on Shannon Gugerty. The rumor mill began churning earlier this year when the UFC stated that they intended to make their centennial event one for the ages. It was first thought that the organization would have all five title belts on the line that night, however it appears that fans will have to settle for ONLY two. St-Pierre has already been confirmed to defend his title against Brazilian sensation Thiago Alves, and if UFC interim heavyweight champ Frank Mir is fully recovered from his knee surgery, he will take on champion Brock Lesnar to unify the heavyweight crown.